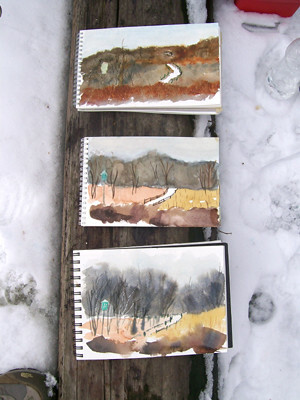 Jan 2011 Watercolor Sketch Class Results – Let's Paint Nature! It is mild, there is no wind, and we are at a sweltering 30°F. After weeks of cooler temps, this is a heat wave in the Chicago area. So mild that the gang decided to sketch outside instead of inside! Yesssss! We are nature diehards! I had a vile of vodka to mix in our water to prevent freezing, but we didn’t even use it. Bring it nature…bring it! 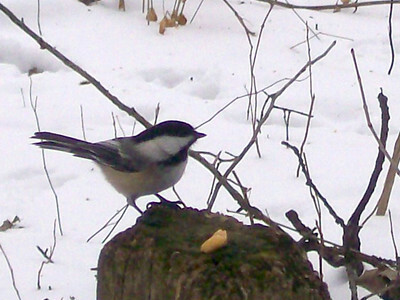 We take the Black Oak Trail and inspect many animal tracks in the snow. I brought my Animal Tracks of Illinois book by Tamara Eder, so we can identify individual species. Some tracks had tail marks, some tracks had drag marks, and some without. It was a real challenge but we did identify a few. 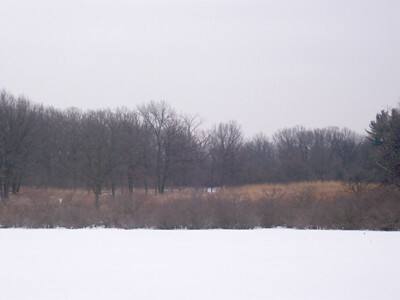 We stand on frozen Long John Slough, with fish at the bottom, frogs and turtles buried in the mud below, looking south at the beautiful amber color of a winter field, wanting to sketch while we are all connected to nature. It works….we connect. Nature even provides us will free easels. We don’t have to pay $200 and carry one around! 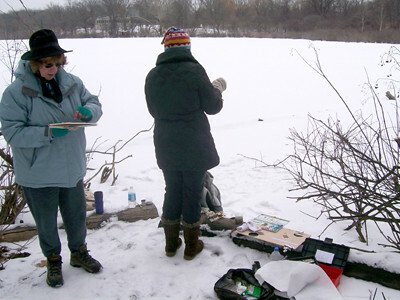 Alanna and Michelle are hard at work, braving the elements, to take a piece of nature home with them. 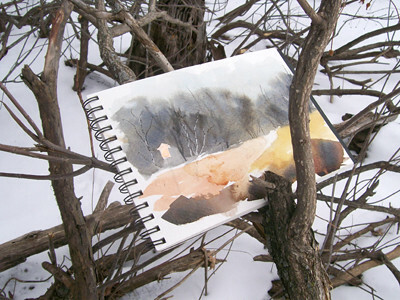 Due to the cold temperature, our watercolor paper was not drying. We had to stop this far and finish at home. Here is my final, finished at home with watercolor detail and black micron pen. 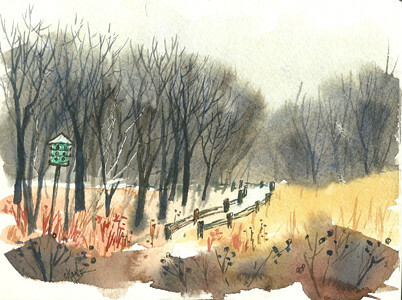 I hope you enjoyed January’s free sketch class results. If you are in the Chicago area, why don’t you join us for the next one on February 26, 2011? Looks like a fun trek. Love the photos and paintings. Wish I lived close enough to join in the class. Lana: Thanks, natural easel ROCKS! jwms1: Thank you, it’s nice to hear feedback and to know my class would have more students if distance wasn’t an issue! gregorbucik: Thanks! Yes, time is always the enemy. Holly: Thank you very much!